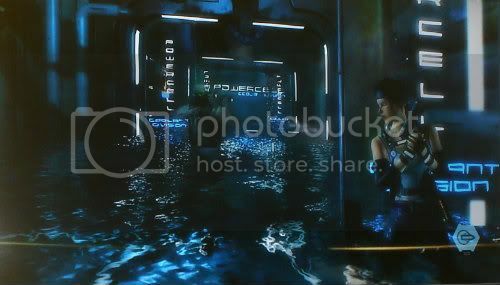 Hydrophobia was released on the PC, and later for the Playstation 3 with an enhanced version. This is a review of the Playstation 3 Version (it is digital only, and has no physical edition). Note: This game was not used with a Motion Controller. 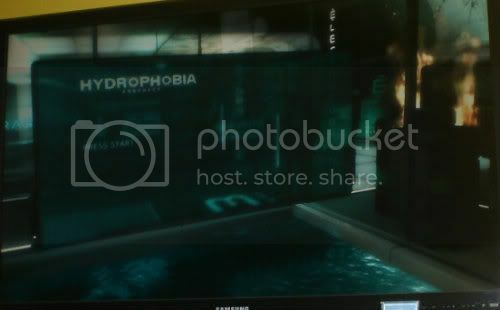 Hydrophobia takes place in a city where you are an engineer with the night off. The world is celebrating the 10 year anniversary of the Queen of the World (a giant ship that houses an entire city), with advertisements of NanoTech in the background (a group who wants to make food for everyone). This immediately reminded me of Journeyman Project, where you roam around your room before a big event, only for a huge catastrophe to happen. Of course, said catastrophe does happen. 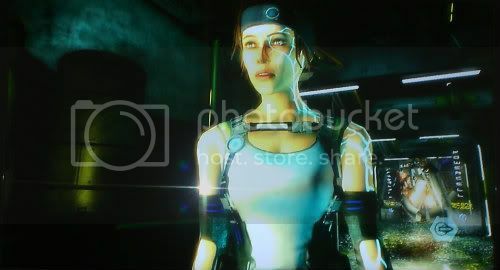 You play as Kate Wilson. You start in your apartment and can explore as much as you like, and even find some hidden objects. All are useless for the game, but they all have a story, which lets you learn more about the character before you begin, such as a picture of her graduation, a letter from her dad, as well as a book with a brief summary of this future world. Your character’s electronics suddenly stop working, so you set out to see your co-worker, Scoot, and fix the problem, only for an explosion to happen while you are on an elevator. You find nothing but chaos on the floors below; everything is damaged, and you find terrorists (Malthusians) have invaded. The story of who they are and the world you are in itself is actually really clever, and is more exciting in the game to experience as they unfold (even though, technically, your character knows this already). 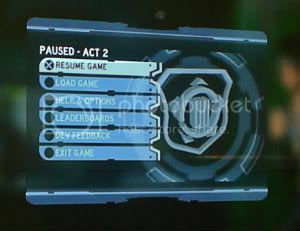 The game starts out with you running around a ship’s deck in 3rd person, and your co-worker Scoot will talk to you to tell you where you need to head to get out alive and where to manually alter some doors (someone on the inside gave the terrorist’s the computer codes and they have all been reset). There is a 3 dimensional map to help you find your way. This map can be flipped in every single direction and zoomed in and out to find the path you need to take. You can also convert it into a ¾ perspective map. The explosions around the area have unleashed water around you; the visuals of the water are the best I have seen from any game, and the mechanics of this are very well designed, also. Sometimes, you will open a door, which will only partially flood the room. Then, another door will flood the room entirely. The water even leaves the room if you open a door to a room which held no water in it. The water effects and the reality of it make for a very fun game, but also terrorize you, because you never know when, at any moment, the entire room will flood while you try to find the exit. The room is only partial flooded here, enough to leave flammable gas vents to tend with. Once the room is flooded, you have 15 seconds to find an exit, or you will drown. What is great about it is, before the water comes, there will be music, and sound effects of creaking pipes and electrical problems; but once the water engulfs you, you hear it all stop, and the only thing you can hear is your arms swimming through water and the ship creaking. This immerses you into the game, immediately tells you something is wrong, and you start to associate the complete removal of all those sound effects and music with “Oh crap; I need to find an exit before I drown. Where is it? Where is it!” It gets creepier; as you drown, it gets harder and harder to see where you are going , and you start to hear voices toward the end which sound like a little kid calling for help. This is made to make you panic and realize you are about to die, and you feel very relieved when you find land just a few seconds before death. Because of what I stated above, the game really draws you into the experience and makes you a part of the game. This is all your doing for an hour or two; no enemies in sight. Eventually, you find the terrorists and have to hide. Then, you find a gun, and the 2nd part of the game begins. This gun is a force gun, and pushes the enemies away. A few light blasts and the enemy falls over unconscious. If you charge it, however, you can unleash a large blast that can stun an enemy unconscious instantly. Shoot them while they are down and you will kill them (as they can get back up shortly). At times, you will be going from room to room, killing enemies. Also, you will be swimming in the water, killing enemies while under the water and trying not to drown (They will normally have underwater gear; you won’t). Luckily, your gun works the same under water as much as it does above it. Later, you will find other weapons, but your default weapon is much better. The only things you will want to use are the grenades. The grenades that attach to the enemy and count down from 10 before exploding are really fun to use. 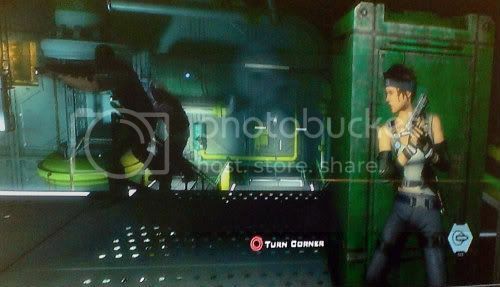 You can ONLY use weapons, as Kate has no experience in hand-to-hand combat. To avoid enemy fire, you have a cover system to hide behind a wall, then release a button to appear briefly out in the open to take shots. Throughout the game, you will need to pull our your computer table (that is see-through) and use it to find hidden keycodes on the walls to get into other areas. In addition, the philosophical works of the terrorists’ inspiration are also hidden on the walls as well, and are just for world-building and getting 100% completion. Finally, you combine with a virus that doesn’t kill you, and it gives you complete control over water. This starts the 3rd and final part for the game. You can cause water to rise very high, and lift boxes with it. Yes, this means puzzles attempts; you must bring a box over electrified water so you don’t die of electrocution, for example. But, it is also useful for pushing back the enemies, and you can also slam boxes and explosives at them. There is a downside to your powers; the virus is slowly killing you. Occasionally, you must collect inoculations to keep the virus at bay; you suddenly become very sick and can only walk, the screen covering up with the virus to prevent you from figuring out where to go. You must find the inoculation quickly or die. Luckily, these are in exact scripted locations, and not on a timer, otherwise you’d be trying to speed through the game the whole time. Unfortunately, I feel this part of the game is over too quickly, and I wanted to play more with these powers. There is a mini-game you unlock after beating the game where you are in a watery arena below and a metal grate upper level around the corners, and you must complete different challenges with your water-based powers. It’s a fun diversion after the game is over; though it can be frustrating until you learn a trick you can use on the AI. While on the catwalk, simply use your water-based powers to bring a box toward you near the corner and block one direction of the walkway completely off. Then bring another box to block the view below so no one can see and fire at you, leaving a medium sized hole on the other corner. Now, there is only 1 direction most enemies can fire at you, and you have a hidey hole should combat not go your way (as you will still need to go out and find the enemies sometimes due to the time limit). Another aspect of the game is hacking. This is done by putting your computer tablet (that doesn’t ever stop working from all the water) near a door and playing a mini-game. Here, you can the control the left axis to increase or shrink a wavelengths size, and the right button to change it’s distance between waves. You must make an exact match of the wavelength already on the screen. It’s not a bad mini-game, actually, and doesn’t overstay it’s welcome. Along with the same tablet you carry, you can see the world on a different frequency; the backgrounds look a different color, and there are words and graffiti from the terrorists, as well as arrows you can follow to the key you need. You can even find the entire teachings of the man that the terrorists follow. In addition, there are arrows and hidden key codes written on the wall. This serves two objectives, a way to find keys, and a way to show through the story that this was an inside job to leave clues for the terrorists once they got on board (a pretty good combo, I’d say). The game is mostly linear, and has a pick up and play at anytime feel to it, as all you have to do is see where you have to go on the map (if it wasn’t there, you could spend a long time backtracking the entire game for no reason). The only problem I had with the game were all the hidden items; and they were mostly memos (I found a bottle of depression pills I couldn’t use for some reason). I like the house items, as it reveals most of the character and is optionality if people want to skip it. However, the problem I have is looking for small hidden objects in a game that is hugely immerse and life-threatening at any moment. These collection items can completely kill the mood and bring you back to reality. When I realized I was running around an entire wall and every single computer to look for memos, I had broken out of the experience and just stopped collecting the items altogether. The story is told in pieces as you uncover it, through your characters room, the memos left my other employees and the terrorist themselves, books on the history of your world, the ship, and the terrorists, plus the hidden keys that actually tie into the plot of the game. The world around you is introduced slowly so it feels surprising. It gets more points not just for the original story, but for how it’s told. This is an independent game, with pretty decent graphics. The water is the best part. 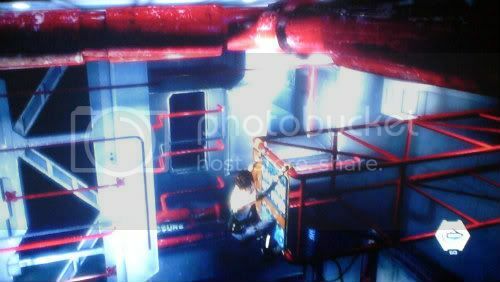 However, since you are on a ship for most of the game, I was surprised at how different each room was from the other; with only 1 room being a copy of another. 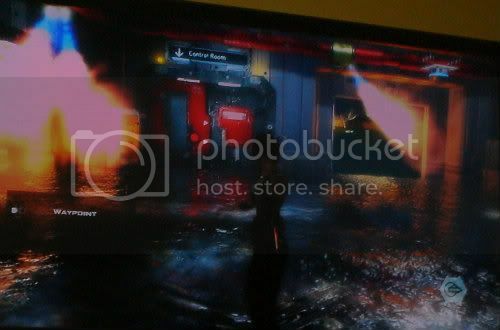 Also, the water tosses on your screen as you move, as if your TV was a real video camera in the water. I don’t remember the music. Do you know what I do remember? The sound of nothing as I scourge a ship looking for survival from explosions, electricity, and fire as they all crackle around me. The sounds of my feet trashing through the water, the slowing down as I try to silently sneak up on someone, hoping they don’t heard my footsteps. The total abrupt silence of nothing but the ship creaking around me while I drown, my breath getting quicker and quicker the more my character thinks they will die, the screen getting brighter and thicker as my mind enters a hazy fog of death. No, it’s not just the music, it’s the combination of music absence, and sound effects, and how they are used, that make this work. This game is really hard in some places on the Hard difficulty. On Normal, it is also fairly difficult. There is one part near the end that I think many people could have a problem with; the 2 symmetrical large rooms (separated by a middle underwater hallway). You have to contend with around 20+ people underwater shooting at you, and people on the balcony (who can hide in cover) shooting at you, twice. I enjoyed the hell out of this game. You scale pipes to climb to higher places. You pull out a gun to shoot at people. You also have some fun grenades you can throw at people. To switch guns or select grenades, you have to pause the game. Though I found that even in hard mode the Force Gun is still the best weapon. Climbing up pipes to get to a room on the floor above you; never has a video game done this before. Aside from going through the game again for the collectibles and medals/trophies, the game is still fun, but might lose some of the immersion when you know what’s coming and what to do. There is mini-game where you use your water control powers in a challenge room. It’s fun and frustrating. I’m torn here, because on one hand, the collectibles really add to the world of the game, but on the other, they ruin the sense of immersion that this game is good at producing. Seriously, how often do you really feel a part of the game. You always feel like you’re going to drown, you’re on edge from falling and fighting enemies. 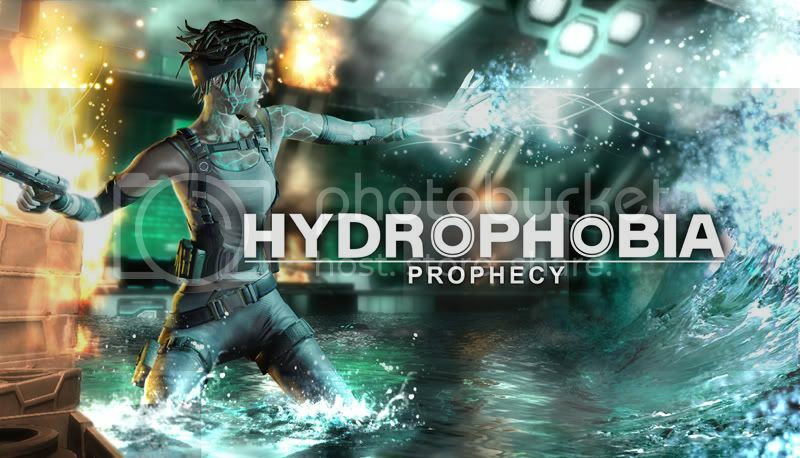 Hydrophobia: Prophecy, is a very entertaining game, and can be yours for a very cheap price. It’s also not very long and doesn’t need that much of a time commitment. I recommend it for people who want to know what it’s like to feel really immersed in a game. I really hope that Episodes 2 & 3 in the planned trilogy actually getting made.